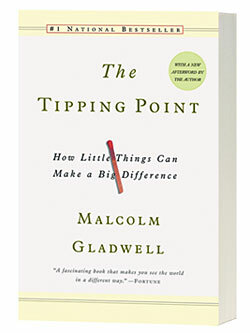 I've been a fan of Malcolm Gladwell since his first book, Tipping Point, where he showed why [I love knowing why] little things can make a big difference. Tipping Point gave me business hope. I learned from a publisher that I did what everyone else did when Gladwell's second book came out. I walked into the store, saw the stack, and with an outstretched hand walked to touch the cover. Blink is about the two-second window of knowing that allows people to be ahead of the curve. Last week, walking shoulders bent against frosty wind in downtown Toronto, I saw Outliers in the window of a closed bookstore. Nothing would do, then, but to find an open bookstore! Outliers lays out the differences people who achieve great success have in common. Startlingly, they seem random, until explained. Great hockey players are born in January. A child born in September is unlikely to make the cut. Big firm Wall Street lawyers were born in 1934 to parents in the garment industry. Lawyers whose fathers were lawyers weren't attracted to the now lucrative field. Success comes after 10,000 hours of practice. Children whose parents don't give them those hours are unlikely to be outliers; people whose success in astoundingly beyond normal. Gladwell is one of my favorite non-fiction writers because of his skill as a weaver. In all three books he leads with point A, then, in chapter two introduces point B and shows how A is incorporated. In chapter three he introduces point C, then weaves in the knowledge of A and B.